There is special concern about the social and emotional tone that teenagers encounter on SNS, particularly in light of widespread news coverage of bullying and sexting. So, the Pew Internet Project did an extensive survey of those ages 12-17 and their parents about the social and emotional tone of social networking sites and reported the findings in November 2011.2 Some of the most noteworthy survey results showed that most teen social networking site users (69%) say their peers are mostly kind to each others on the sites; but that 88% of such site users have witnessed others being mean or cruel at least occasionally. More than three-quarters of SNS-using teens (78%) reported at least one good outcome from their use of the sites and 41% reported at least one negative outcome. And 15% of teens say they themselves have been the target of online meanness. The results reported here round out those findings by describing the adult side of the story, specifically, the social and emotional tone that adults encounter on social networking sites. In August 2011, we asked adult SNS users many of the same questions we asked teens in that earlier work. We queried adults about 1) what they observed about the way people treated each other on social networking sites; 2) how they themselves were treated on the sites; 3) how they and others responded when they saw anti-social and cruel behavior unfolding on the sites; and 4) some of the beneficial and harmful impacts they experienced in their lives because of their use of the sites. This survey involved 2,260 adult respondents overall (ages 18+) and was conducted between July 25 and August 26, 2011. The survey was conducted in English and Spanish and included 916 interviews on cell phones. The overall margin of error for the sample is plus or minus two percentage points. The questions asked of social networking users were given to 1,047 users of SNS and Twitter. The margin of error for that sub-group is plus or minus three percentage points. 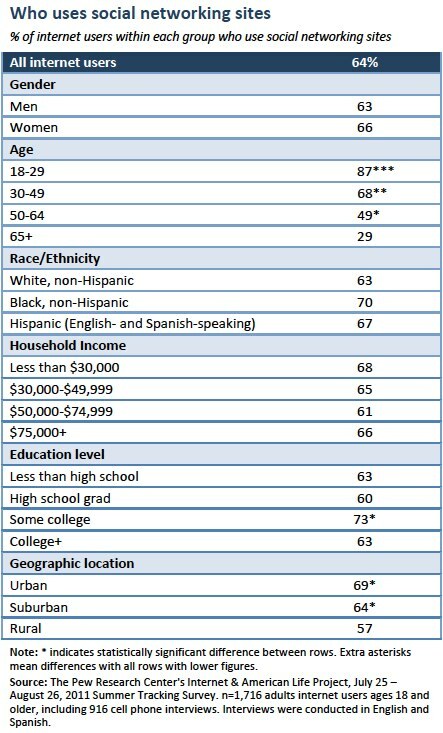 In this survey, 64% of online adults use social networking sites – that amounts to half the full adult population. Among internet users, social networking sites are most popular with young adults under age 30. As of August 2011, there were no significant differences in use of social networking sites based on gender, race and ethnicity, and household income. The survey found that 87% of SNS users have a profile on Facebook, 14% have one on MySpace, 11% use Twitter, 10% have a profile on LinkedIn and 13% describe using other social networking services. 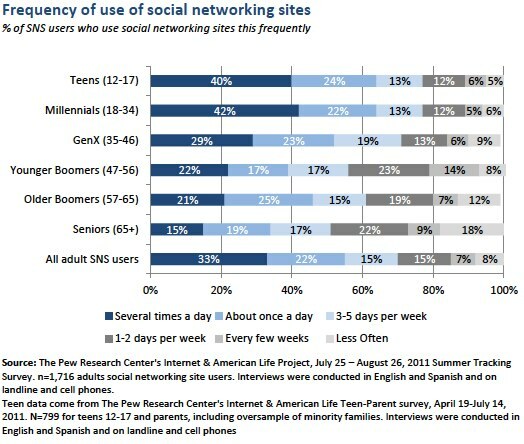 When it comes to using SNS, the younger a user is, the more likely she is to log onto the site frequently.